Ages ago I bought a package of crepe paper (like this—the folded sheets, not streamers). An impulse purchase simply because... it was orange? The other day I finally made some flowers with it while watching way too much HGTV. These will be nice gift toppers, or maybe I'll do more and make a wreath. Cut 12 circles from a sheet of crepe paper, any size you like depending on how big you want the final flower to be. I accordion-folded a strip of paper and cut multiple circles at once. No need to be too precise; freehand circles will do. Orient each petal so the grain in the paper runs vertically. Apply a bit of glue at the bottom of the petal and pinch it to create small gathers. When the glue has dried, press both thumbs into the center of each petal and stretch the paper to curl the edges inward, forming a bowl shape. 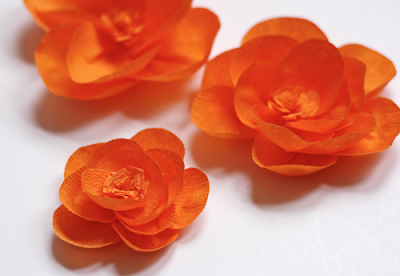 Cut out a small circle of cardstock (about the same size as the petals before you shaped them.) Glue five petals around the outside edge. Then stagger four petals inside that ring, followed by three petals in the middle. 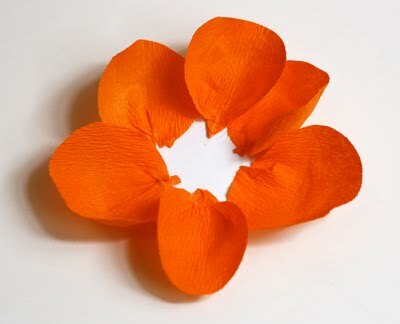 To make a center for the flower, cut a small strip of crepe paper and fold it in half. Cut notches along one long edge of the doubled paper to make fringe. 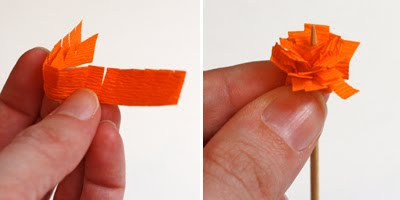 Roll the fringed paper around a toothpick and secure with glue. Finally, glue this piece into the center of the flower. Cute!! These flowers would make a wonderful decoration at a shower. cute cute cute!!! I'm going to make a few and smother them in glitter ;) Thanks so much for the idea! Such a great idea! Thanks for sharing! Would be fun to put a bunch on a string as a garland. But you lost me at "trim off the tips of the fringed loops". Where did we get loops? Maybe I'm dense today from the never-ending winter. Or maybe it's 'cause Courtney's here. Anyway, in case somebody else is dense too, will you clarify that? Here, Mum, I edited. I had actually folded the paper the other direction and cut notches into the folded edge. But this way is simpler. Does it make sense? Good to do while watching hgtv! So cute! Crepe paper brings back so many fond memories. We always used it to decorate for parties when I was growing up. Sweet and simple, yet exquisite and dynamic! Thanks for the perfect tute! wow! Que bonitas y fácil de hacer. Just what I need. Un saludo y felicidades. I love these--thanks for the instructions! you are the paper crafting queen. just posted about crepe paper (streamer) topiaries today. love it! do you think this would work with tissue paper? or do you need a little bit of strength? so pretty. i never thought to make a flower from crepe paper. w0w!! This is super amazing! I have thought about something similar for the exterior petals but I've never thought of doing the little middle part of the flowers. Looks great, thanks for the tute. I have some crepe paper and am going to get using them! They're gorgeous. I'm gonna try them myself, but unfortunately, I only have pink crepe paper which is not even nearly as beautiful as this orange one. thanks for sharing - they're so pretty! oh I love these! Thanks so much! This looks so simple that a walking craft disaster like myself can successfully make these! I can't wait to try! Fighting urge to make a ton of these and put them on anything that can't get away quick enough. Very nice tutorial! Bees, if you find your family, friends, and pets won't come within 10 feet of you, you've probably made too many. R's Adventures, I think tissue paper will tear if you try to do this method on it. 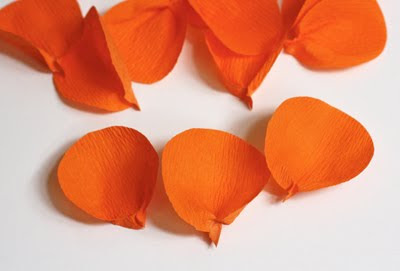 Crepe paper has these little tiny folds built in and is stretchy, so when you do the step where you form the petals into bowl shapes, the paper gives a little and lets you shape it. Tissue paper would just tear at that point. Sarah, I'm sorry to tell you that your purple scissors won't work for this project. 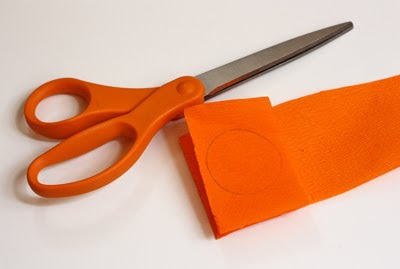 Only orange scissors will cut crepe paper. I too am an orange fanatic and buy things just cus...well, their orange. These flowers are adorable. I have to follow your lead! Aw, c'mon Jess.... purple scissors will cut purple crepe paper!! No. Purple scissors will cut nothing. Oh. I'm glad mine is gray then. So pretty! And I LOVE the orange! I used crepe paper to make flowers for an outdoor wedding. The bright colors added to the beautiful day. I love these and can't wait to make them. Thank you for sharing this tutorial! These are adorable I can thin of so any great uses for them! Could be time consuming but I got lots of naptime to work with! Very pretty. I just did a workshop in making crepe flowers. Gorgeous orange color. Great tut'... I like to do the flower to put on a card!!! very awesome and love the color! I'm definitely going to save this tutorial for my upcoming wedding!! The flowers are so pretty! What a great idea. I am going to have my daughter make some flowers like this to put on her grandparents Christmas present. It will be a Christmas Flower they can keep for years to come. this is great! I love working with paper. How much do I love your tutorials!! The flower looks great, very easy and inexpensive. 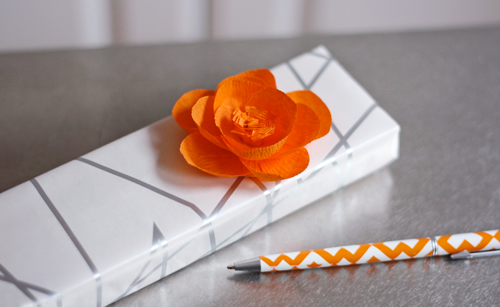 Excellent for decorating a gift. I love these! I made one this morning using some junk mail postcards...yay recycling! I am also going to attach some green 22 gauge wire to the back and make a bouquet of flowers. Thanks for the awesome tutorial, very thorough and clear! Featured this on my blog! Hope you don't mind! These are just great! Thanks so much. Just what I was looking for. It looks simple and easy.